Good Grief is a magazine about navigating life after loss. Lighthearted without making light of pain, Good Grief acknowledges that people in their 20s and 30s may be the first among their friends and peers to experience significant losses like illness, death, or divorce. The magazine offers advice, creative inspiration, introspection, and community for anyone in search of it. The inaugural issue centers on food and its complicated relationship with grief. Last year was a challenging, painful year for so many people I love. Some of my closest friends and beloved family members encountered death, illness, divorce, and other experiences that left them feeling alienated, adrift, and alone in their pain. Loss and grief were constantly on my mind, yet I had no idea how to best support my grieving friends and family members. So I began my own exploration of grief, and found some incredible resources for both those who are grieving and for anyone wondering what the heck to do to help those they love. I want the magazine to serve as both a collection of those resources and a non-threatening, lighthearted conversation starter for a subject that doesn’t often see the light of day. My primary hurdle for this project was the subject matter. I wanted to create a magazine centered on grief, a challenging subject that people often wish to avoid. This meant that the tone needed to tread the tenuous ground between heartfelt and sentimental, and that the layout needed to present difficult concepts and stories in a welcoming way. Though I thought I had a strong sense of the direction of the magazine from my own personal experiences, it took quite a bit of refining and feedback to focus in on my mission and audience, and create a magazine that fit their needs. When defining the audience, I examined the needs of each user and created categories that represented these needs. Readers who are supporting someone grieving, for example, are likely seeking concrete tips and advice on how to help their friends, while those experiencing loss might look for personal essays from people who have gone through something similar. These categories became incredibly valuable in selecting articles for the magazine, and served as a barometer for how well the magazine was serving the readers. 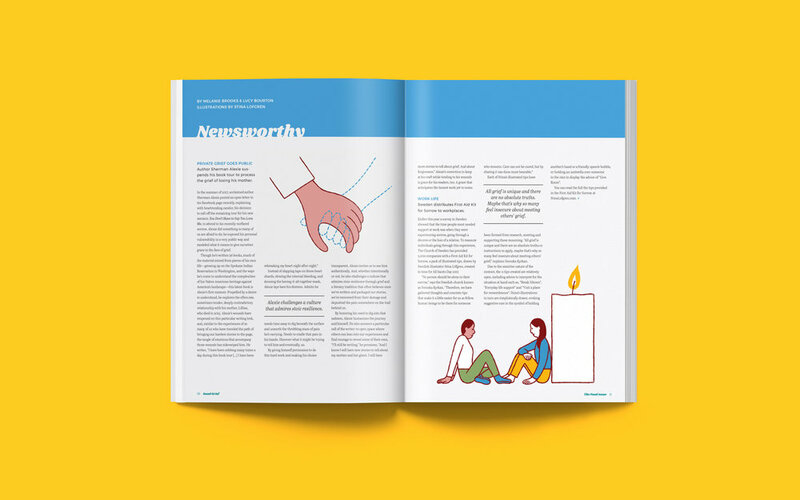 A large part of meeting my personal goal for the project—to create a collection of resources that could also serve as a conversation starter—meant solving for the right tone of the magazine. First, I established was the magazine is (friendly, playful, uplifting, lighthearted, sensitive) and what it is not (religious, Hallmark-y, a therapist). Using those characteristics as a guide, I made visual choices that supported the tone. The bright color palette and retro type help to establish the friendly and welcoming voice, while well-lit, single-subject photography lends to sensitivity and intimacy from first glance. I also found some wonderful illustrators whose work is both playful and heartfelt. Finally, the topic of this particular issue was also a part of the solution. I explored food and grief in this issue, and I found that centering the discussion on food made for a more natural entryway to a difficult topic. Everyone has powerful memories and experiences associated with food. Framing the conversation around something that everyone can immediately connect with was extremely helpful in creating both a resource and a conversation piece.